On May 12, activists blocked entry to the main gate at the Navy’s West coast Trident nuclear submarine base in an act of civil resistance to nuclear weapons. Ground Zero Center for Nonviolent Action (Ground Zero) held a peaceful vigil and nonviolent direct action at the main gate to Naval Base Kitsap-Bangor in Silverdale, Washington. 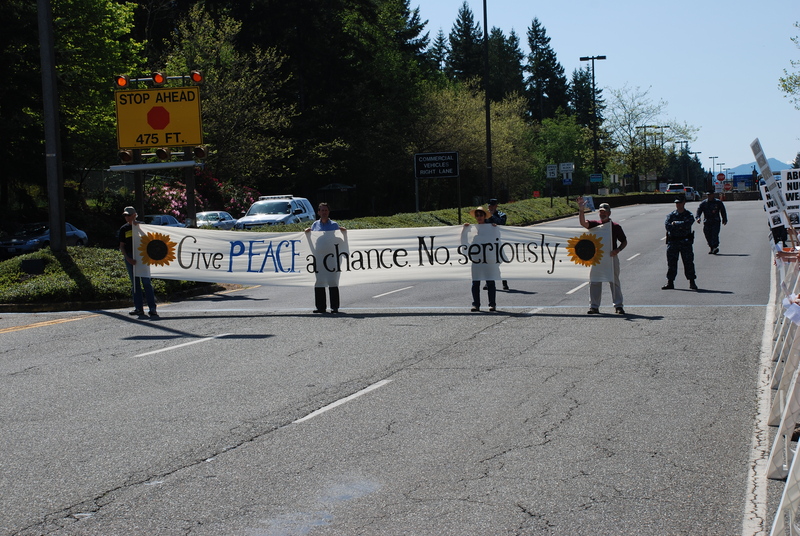 They protested the U.S. government’s continued deployment and upgrading of the Trident nuclear weapons system. All four protesters complied with Washington State Patrol officers when ordered to leave the roadway. Elaine Hickman, Seattle; Tom Rogers, Poulsbo; Bert Sacks, Seattle; and Carlo Voli, Edmonds, were cited for “Pedestrian in Roadway Illegally” (a traffic offense) and released at the scene. Earlier in the day participants learned about nuclear weapons effects (with an emphasis on the Trident system) and U.S. nuclear weapons policy. They also participated in nonviolence training as is customary before every Ground Zero vigil and action. Throughout the Saturday protest trained peacekeepers from Ground Zero ensured the safety of all participants, communicating with State Patrol and base security personnel as needed. “Moms Against Bombs” was the theme of the day planned to honor the original intention of Mother’s Day for Peace. During the roadside vigil women took turns reading Julia Ward Howe’s Mother’s Day Proclamation of 1870. Ground Zero holds three scheduled vigils and actions each year in resistance to Trident and in protest of U.S. nuclear weapons policy. The group has been working to stop the Navy’s plan to build a $715 million Second Explosives Handling Wharf at Bangor. Ground Zero is also working to de-fund the Navy’s plans for a next generation ballistic missile submarine, estimated to cost $99 billion to build. For nearly thirty-five years Ground Zero has engaged in education, training in nonviolence, community building, resistance against Trident and action toward a world without nuclear weapons.